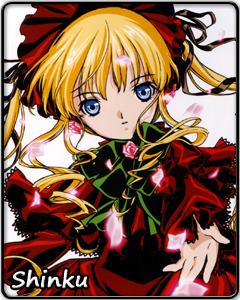 The fifth of the Rozen Maiden dolls, Shinku is what you would call a Victorian aristocrat. She can be extremely demanding and can seem unappreciative of other. Shinku rarely shows her emotions no matter how strong she feels them, thoush she is perceived as a rather angry doll, even though that is not true. She is one of the dolls interested in the Alice game, and wants to prove that she is most deserving of becoming Alice. However, she begins to show her own emotions after her older sister and rival Suigintou pulls out her arm, and she changes her habits due to tremor. Though she takes pride in lecturing, slapping, and generally abusing her medium and male lead Jun Sakurada, she cries over her imperfection in front of him. Her personality is the reason other sisters look to her as an older sister, even though she is technically younger than the majority of them.Outside of the Alice Game, Shinku is obsessed to the Detective Kun Kun series and has a volatile hatred towards cats. Shinku's Saimoe experience in Japan's 2005 competition was not easy. Immediately in the first round, she had to face Fate Testarossa (Nanoha). Her 18 point victory marked the beginning of the Rozen Maiden vs. Nanoha rivalry. Her second round was not easy, as she had to face her older sister Suigintou in another Alice Game rematch, to which she merely edged by 53. After and easy third round, Shinku had to face Suiseiseki, another one of her older sisters, in the round of 16, to which she won by 46 in a close battle. An easy trip in the round of 8 led to a semi-final loss with eventual champion and Fate's friend Nanoha Takamichi (Nanoha), and Shinku eventually finished in third place. Shinku followed that up the next year ironically behind Suiseiseki's shadow with a dismal early exit in Korea and a quiet Japan campaign in which she finished in 11th after a loss to Chikaru Minamoto (Strawberry Panic). At a local caf�, Shinku kept her bags of tea while she watched Suiseiseki take the spotlight as Suiseiseki swept both championships. In 2007, it became clear that Shinku was fated not to do well in Korea at all, as she lost in a close match to Nayuki Minase (Kanon) in the round of 32, finishing in 18th. She then turned her attention to Saimoe Japan. After an explosive preliminary session, including a victory over Nodoka Miyazaki (Negima?!) in the second round, Shinku took her momentum into the round of 16, where she easily defeated Ayumu Nishizawa (Hayate no Gotoku) by 307 votes. However, her competition became even tougher, as she faced Tsukasa Hiiragi (Lucky Star), who upset defending champion Suiseiseki in the round of eight. After Shinku scraped by with a 58 point win, she became a clear favorite to win Japan's Saimoe crown. Unfortunately, in the semi-finals, it was total d�ja vu for Shinku, as she lost to Cinderella story and eventual champion Rika Furude (Higurashi no Naku Koro Ni) by only five votes, marking the second time she has lost to an eventual champion in the semi-finals. Afterwards, an invitation to Korea's Super Best Moe competition resulted in a preliminary knockout for Shinku.